I hope your New Year is off to a good start. I have a potential trade going on that includes a bunch of cards, one of them being the Fotos postcard of Martin Dihigo. I wanted to let you know before I did anything with it because I promised you first crack at it. 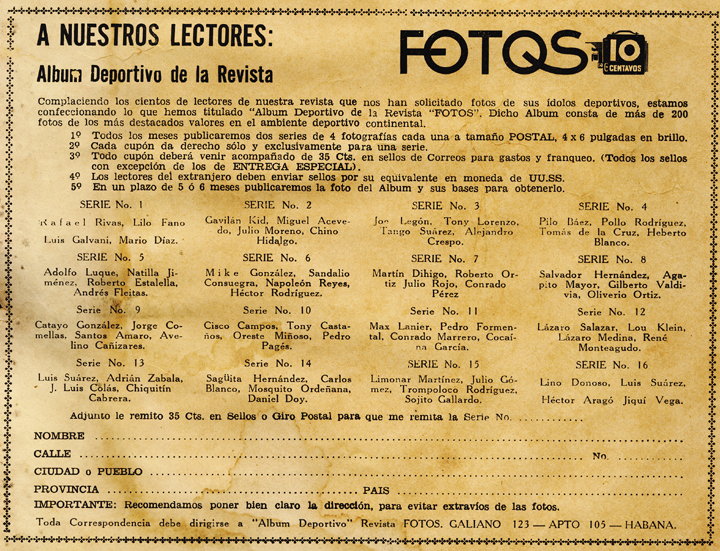 If you're still interested, let me know ASAP. SOLD!!! 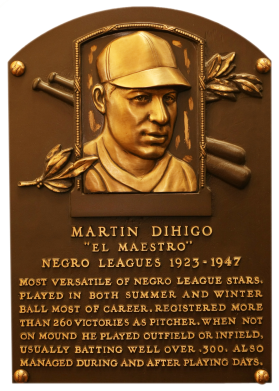 Shown above is one of the three known copies of a 1946-7 Fotos Postcard of Martin DiHigo. 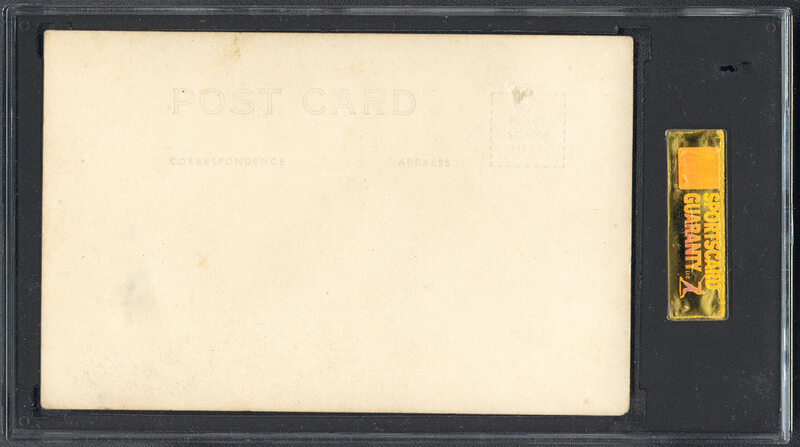 The card is in fair condition with rounded corners and one small wrinkle visible on the reverse. 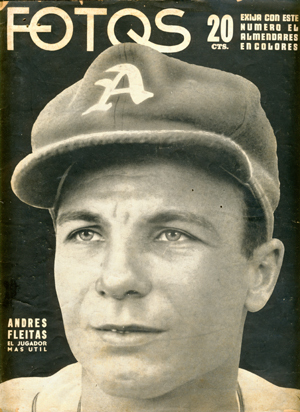 The picture shows DiHigo during his playing days in the Mexican League with Club Cienfuegos. In addition to the card shown, SGC has also graded an GOOD 30 and VG 40 and there's really not much difference between them as far as condition goes. 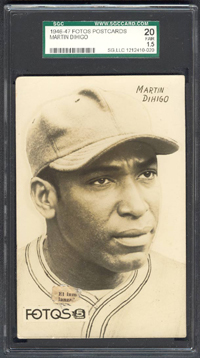 The SGC 40 is sepia toned with a stained back, the SGC 30 is very dark and portrays DiHigo in almost an angry manner. 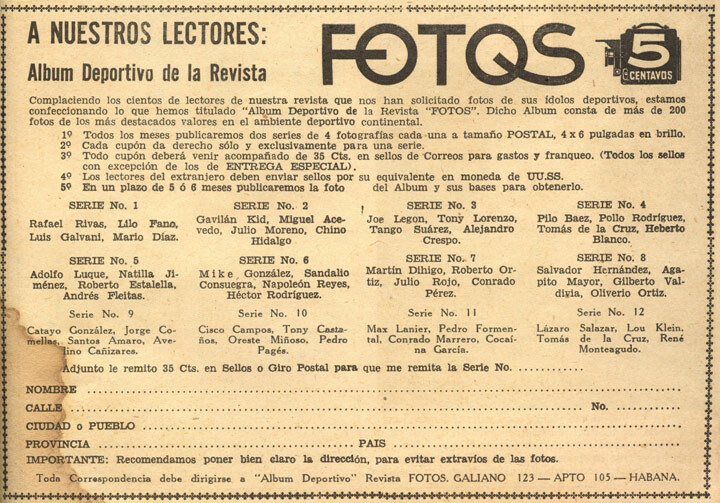 The card shown above has a small newspaper clipping stuck to the front just above the Fotos logo. 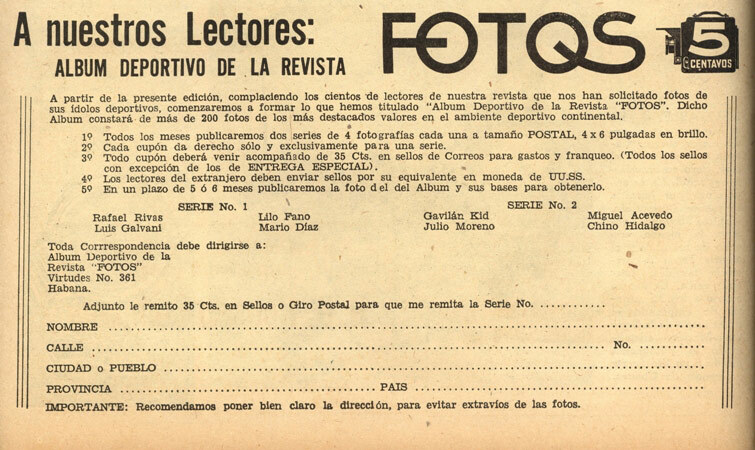 It once read, "El Inmortal Lanzador" - the Immortal Pitcher in Spanish. 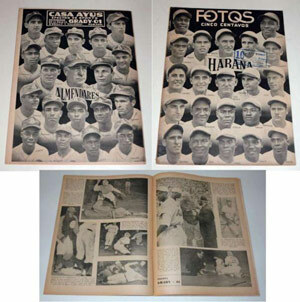 Fotos was a prominent sports publication up until Fidel Castro came in to power. 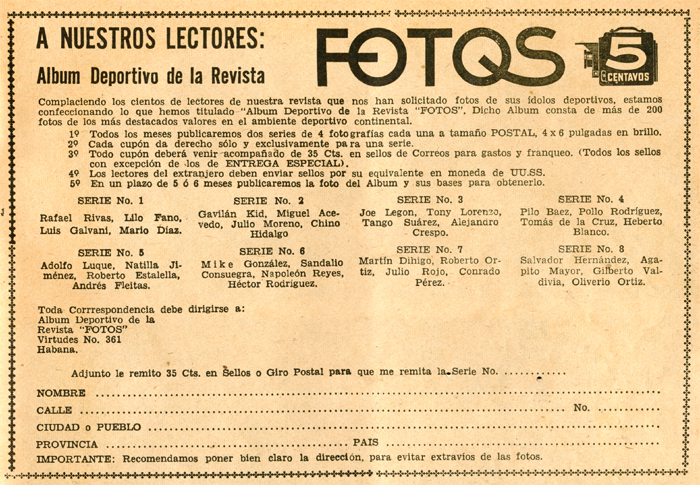 Beginning in September of 1946, Fotos Magazine offered 2 series, each having 4 postcards. Subscribers could clip out the coupon from the magazine and order the postcards by series. 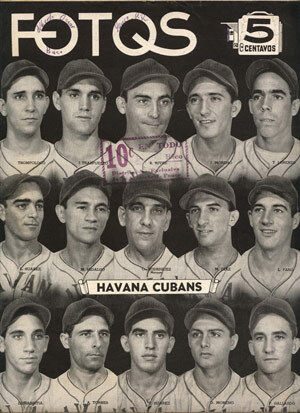 The advertisements contained a list of all player cards available at that time. 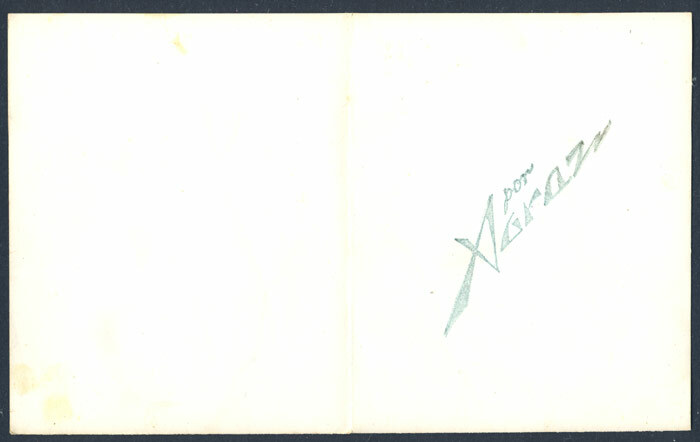 December, 1946 contained the new series 7 (DiHigo) and 8, along with 1 through 6. 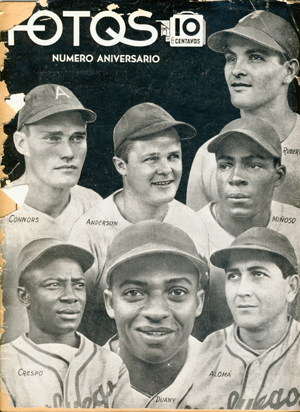 Older series were available until the last issue in May, 1947. So, it's safe to say the last cards may be the rarest having been available the least amount of time. But, this has not yet been proven with so few cards remaining from any of the series. 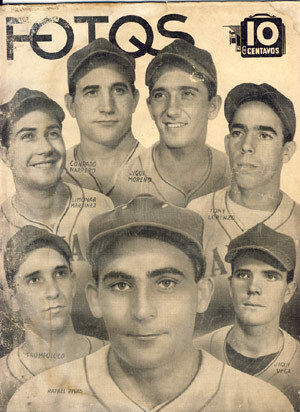 There were a total of 18 different series offered - 72 cards in the set. 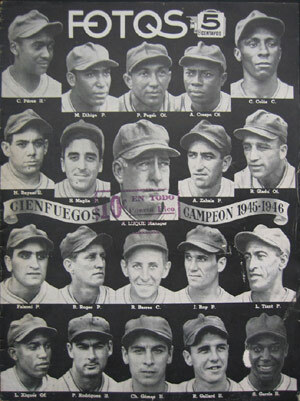 The February, 1947 issue pictures the champion Cienfuegos team with Martin DiHigo and coached by Adolfo Luque. 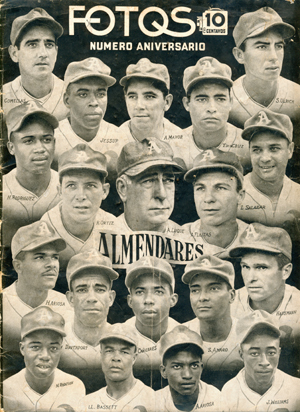 A team picture is also shown on the back of that issue. 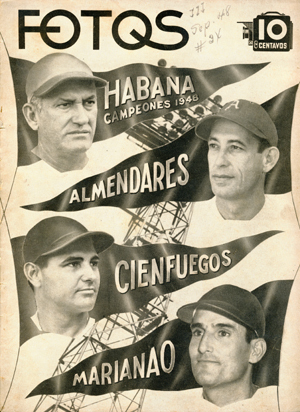 5" X 8" Promo item from the Cuban Sports Magazine "Fotos" celebrating the New Year (1948). 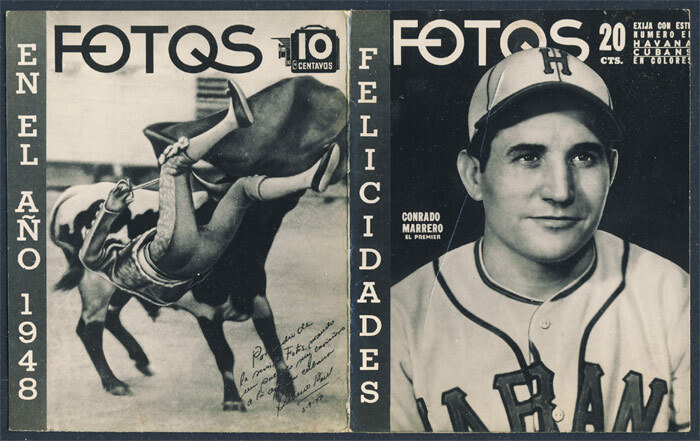 Folded in half as indicated, one side has a great shot of Cuban Star Connie Marrero the other side a photo of a Bullfighter.